Predicting and monitoring cardiovascular disease is often expensive and tenuous, involving high-tech equipment and intrusive procedures. However, a new method developed by researchers at USC Viterbi School of Engineering offers a better way. By coupling a machine learning model with a patient's pulse data, they are able to measure a key risk factor for cardiovascular diseases and arterial stiffness, using just a smart phone. Arterial stiffening, in which arteries become less elastic and more rigid, can result in increased blood and pulse pressure. In addition to being a known risk factor for cardiovascular diseases, it is also associated with diseases like diabetes and renal failure. "If the aorta is stiff, then when it transfers the pulse energy all the way to the peripheral vasculature – to small vessels – it can cause end organ damage. So, if the kidneys are sitting at the end, the kidneys get hurt; if the brain is sitting at the end, the brain gets hurt," said Niema Pahlevan, assistant professor of aerospace and mechanical engineering and medicine. By measuring pulse wave velocity, which is the speed that the arterial pulse propagates through the circulatory system, clinicians are able to determine arterial stiffness. Current measurement methods include MRI, which is expensive and often not feasible, or tonometry, which requires two pressure measurements and an electrocardiogram to match the phases of the two pressure waves. 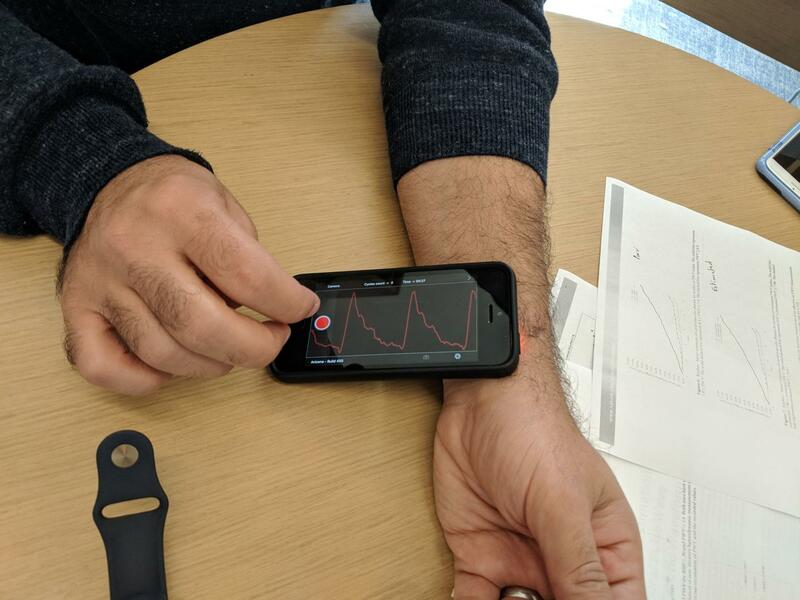 The novel method developed by Pahlevan, Marianne Razavi and Peyman Tavallali uses a single, uncalibrated carotid pressure wave that can be captured with a smart phone's camera. In a previous study, the team used the same technology to develop an iPhone app that can detect heart failure using the slight perturbations of your pulse beneath your skin to record a pulse wave. In the same fashion, they are able to determine arterial stiffness. "An uncalibrated, single waveform – that means that you eliminated two steps. That's how you go from an $18,000 tonometry device and intrusive procedure to an iPhone app," Pahlevan said. "It's very easy to operate," added Razavi, who is the director of biostatistics for Avicena LLC, the startup company developing the app. "I actually taught my kid to do it." Instead of a detailed waveform required with tonometry, their method needs just the shape of a patient's pulse wave for the mathematical model, called intrinsic frequency, to calculate key variables related to the phases of the patient's heartbeat. These variables are then used in a machine learning model that determines pulse wave velocity (PWV) and, therefore, arterial stiffness. To validate their method, they used existing tonometry data collected from the Framingham Heart Study, a long-term epidemiological cohort analysis. Using 5,012 patients, they calculated their own PWV measurements and compared them with the tonometry measurements from the study, finding an 85 percent correlation between the two. But more importantly, they needed to determine whether their method could be used to predict cardiovascular disease. "What the clinician wants to know is whether or not you're helping them to improve outcome," Pahlevan said. "And we showed that it is as predictive as the actual tonometry." Through a prospective study using 4,798 patients, they showed that their PWV measurement was significantly associated with the onset of cardiovascular diseases over a ten-year follow up period. Their study was published in Scientific Reports in January. "A lot of people have tried to bring machine learning to medical devices, but pure AI by itself doesn't work," Pahlevan said. "When you get a high correlation, you can be missing all of the diseased patients because, in medicine, the outliers are the cases you want to capture – they're the important ones." The reason their machine learning method is able to capture clinically significant outcomes is due to their intrinsic frequency algorithm, which is the mathematical analysis used to calculate physically relevant variables relating to the patient's heart and vascular function. The main variables represent the heart's performance during the contraction phase (systole) and the vasculature's performance during the relaxed phase (diastole). Developed just three years ago during Pahlevan's postdoctoral work, the team plans on expanding on the intrinsic frequency algorithm so that it can be applied to a number of other applications, such as detecting silent heart attacks. Pahlevan is a faculty member at the USC Michelson Center for Convergent Bioscience. The Michelson Center brings together a diverse network of premier scientists and engineers under one roof, thanks to a generous $50 million gift from orthopedic spinal surgeon, inventor and philanthropist Gary K. Michelson, and his wife, Alya Michelson. At the Michelson Center, scientists and engineers from the USC Dornsife College of Letters, Arts and Sciences, USC Viterbi School of Engineering and Keck School of Medicine of USC are working to solve some of the greatest intractable problems of the 21st century in biomedical science, including a fundamentally new understanding of the cell and new approaches for cancer, neurological and cardiovascular disease. Engineering Studies began at the University of Southern California in 1905. Nearly a century later, the Viterbi School of Engineering received a naming gift in 2004 from alumnus Andrew J. Viterbi, inventor of the Viterbi algorithm that is now key to cell phone technology and numerous data applications. One of the school's guiding principles is engineering +, a term coined by current Dean Yannis C. Yortsos, to use the power of engineering to address the world's greatest challenges. USC Viterbi is ranked among the top graduate programs in the world and enrolls more than 6,500 undergraduate and graduate students taught by 185 tenured and tenure-track faculty, with 73 endowed chairs and professorships. http://viterbi.usc.edu/?